Users who are working with an iPod for the first time to store and play their favorite digital music may find it tricky to transfer music from iTunes to iPod. If you’ve made a purchase of a music album from the iTunes store, in order to listen to it on your iPod, you will need to synchronize the music files to your Apple device through iTunes first. It is a fairly simple process and will be covered thoroughly in this tutorial article. As mentioned above, you can transfer all sorts of digital music on to your iPod through the iTunes software. It should be in a format that is supported by your iPod, preferably in MP3 format. 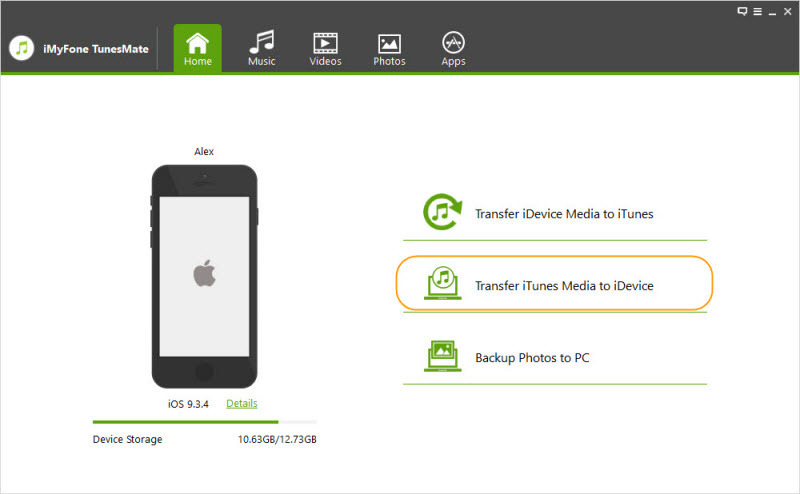 In order to automatically transfer digital music to your iPod, follow these simple steps. Step 1:	Open the music menu that can be found on top of the iTunes window. Enable the Sync music option by ticking the box next to it. Step 2:	In the event, you want to sync all your music files on to your iPod, locate the entire music option and select it. Step 3:	To selectively transfer music files, choose the option that says select playlists, artists, albums, genres. Finally, confirm your selection by pressing the apply button and let the syncing process begin. To manually transfer all your music files through iTunes, you need to change some configuration settings first. Step 1:	Go to the summary tab which can be found on top of the main iTunes window. Step 2:	Select the manually manage music option and confirm your selection by pressing apply. You have successfully altered the configuration settings of iTunes to transfer music manually. Let’s proceed to the next step. Step 3: Locate the Music pane underneath the iTunes library. Step 4: Select all those songs that you want to transfer to your iPod from the iTunes panel. You can select multiple songs by holding down the CTRL key. After you’re done selecting the songs that you want manually sync to your iPod, drop them in the iPod icon, on the left side of the iTunes window. Click on apply and let the magic happen. Although the iTunes software is the go to software for syncing files, it has its drawbacks. It is unable to transfer a large number of media formats such as AVI, XVID etc. If you want to transfer media on to your computer from you Apple device, iTunes will not let that happen. You can use alternative file transfer software to bypass these limitations. We have just the one for you. TunesMate has been designed to conveniently transfer unlimited iTunes libraries to unlimited iDevices, without imposing any restrictions. 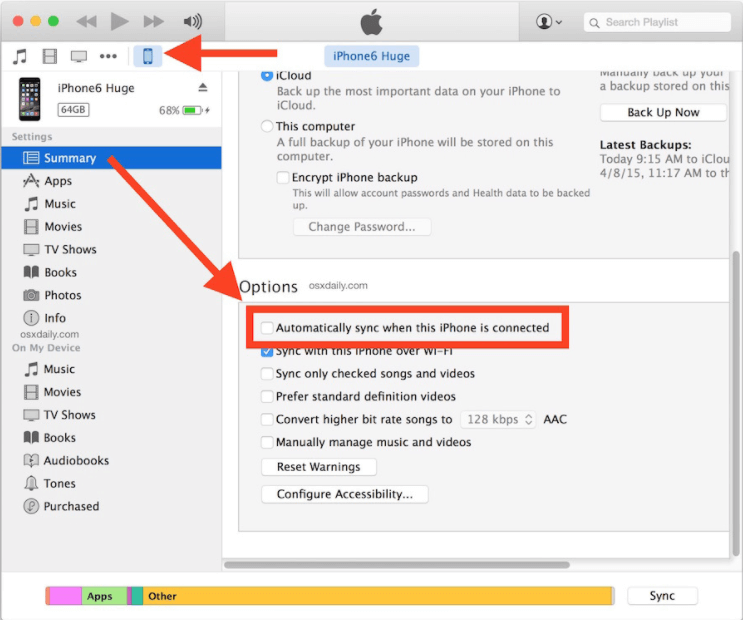 You don’t require a password or any sort of authorization to sync your iTunes files to iPhone/iPad/iPod. TunesMate does not discriminate between paid and free media and transfers them both without hesitation. Worried about losing old data? Don’t fret! TunesMate has you covered. It promises zero loss of data while transferring the files. Do you wish to selectively sync media files to your apple device? iTunes gives the user that option as well. You don’t need to be a tech geek to use iMyFone TunesMate. It has a simple interface designed to transfer media and apps conveniently. Step 1: After installing TunesMate, initialize it. Step 2: Click on the tab “Transfer iTunes Media to iDevices”. And select files that you wish to transfer and with a single flick of the mouse. 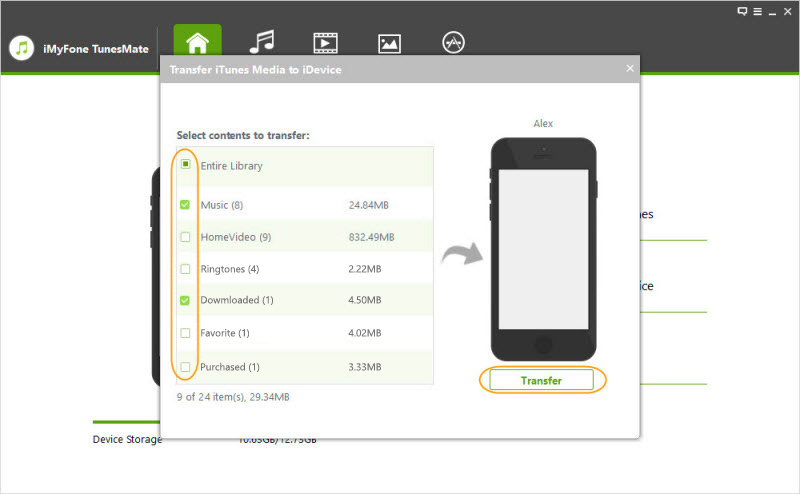 Step 3: Click on the “Transfer” button sync your iTunes data to your Apple device. There are a number of reasons why I prefer TunesMate over iTunes. •	Even if your apple device is not registered to the same apple ID, TunesMate will let you transfer all sorts of music, whether it is paid or non-paid. iTunes on the other hand, gives you no such freedom. •	It rarely gives errors while syncing files, whereas iTunes is known for its troublesome errors that impede the synchronization process. iTunes does not support all types of files. •	Many popular media formats are not accepted by the iTunes software. However, no such problem arises while using TunesMate. •	TunesMate provides the users with three options for deletion of files: selective deletion, deleting all files at once and one by one deletion. In iTunes, the user can either delete all files in one go or delete files one by one which can be a time consuming and hectic process. •	TunesMate is easy to navigate and has a simple interface, suitable for all kinds of users, whether they are beginners or advanced users. 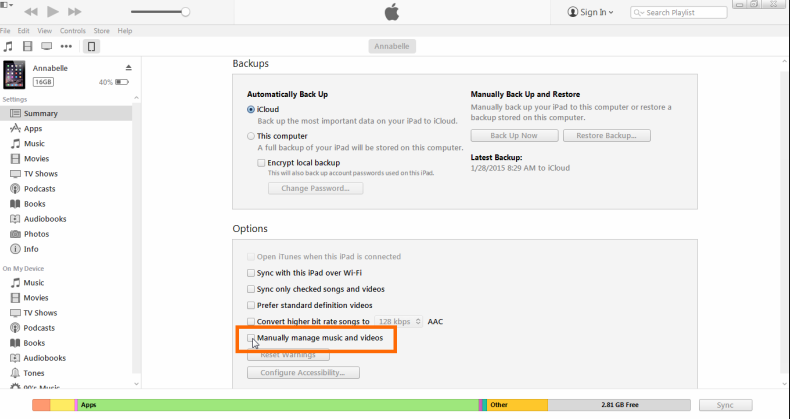 How to Save iTunes Movies to External Hard Drive?